Grip car 10 at the eastern terminus, next to Portsmouth Square. 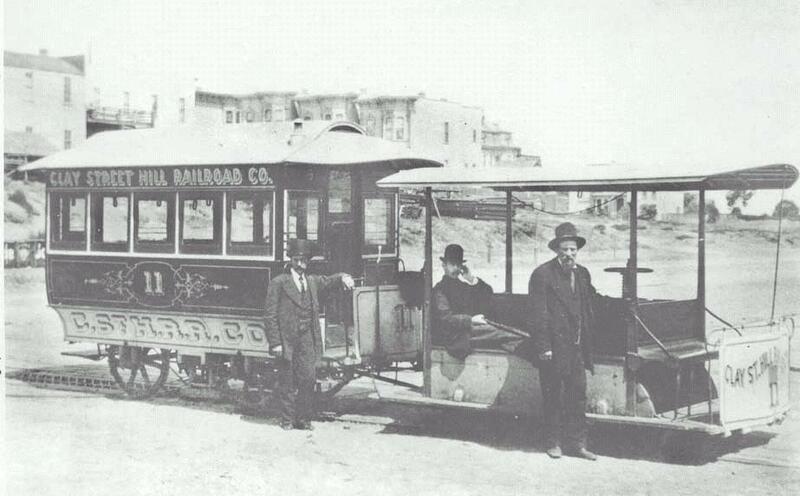 Some sources say that the picture was taken in 1873 and that the man on the left end of the front bench is Andrew Hallidie (Source: "Market Street Railway Company, Past, Present and Future", San Francisco News Letter, Sep 1925). Sep, 1997 Picture of the Month. extended: 1877. Clay Street to Van Ness. turntables: double turntables at each end. Each was used to turn the car 90 degrees. This was necessary because the cable ran through the turntables. 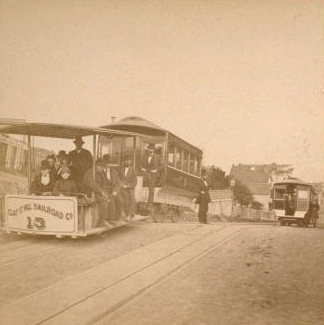 The first person to propose a cable car line in San Francisco was Benjamin H. Brooks, an attorney. City records show that Brooks was granted a franchise for a cable line in 1870, along with C.S. Bushnell, E.W. Steele, and Abner Doubleday, the man who didn't invent baseball in Cooperstown, NY. They proposed a long system from downtown on various streets out to Cow Hollow. Brooks and engineer W.H. Hepburn worked out many of the mechanical details of the system. Brooks and his associates were unable to find financing, and Brooks' legal business was time consuming, so they sold their franchise to Andrew Smith Hallidie, a wire cable manufacturer. 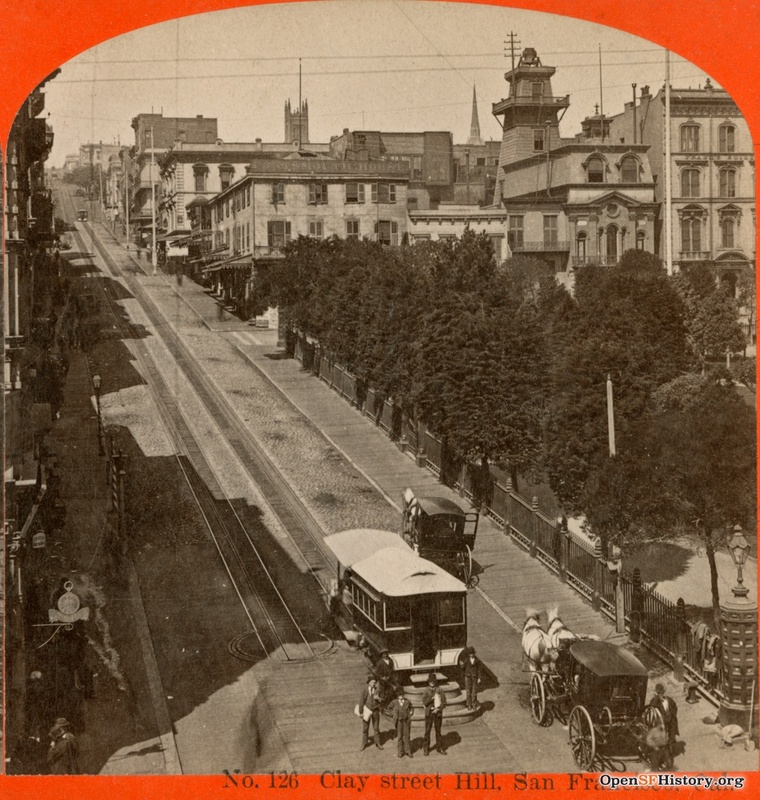 Hallidie was able to find the financing to build the Clay Street Hill Railroad, the first successful cable car line. The primary investors were Joseph Britton, Henry L Davis and James Moffitt. Builder William Sinon was one of the incorporators and built the powerhouse. The line was largely designed by William E. Eppelsheimer. The first test run took place on 02-Aug-1873, and revenue service began on 01-Sep-1873. Andrew S Hallidie (Source: [volume 27:group 21:117a], Jesse Brown Cook Scrapbooks Documenting San Francisco History and Law Enforcement, ca. 1895-1936, BANC PIC 1996.003--fALB, The Bancroft Library, University of California, Berkeley. ). 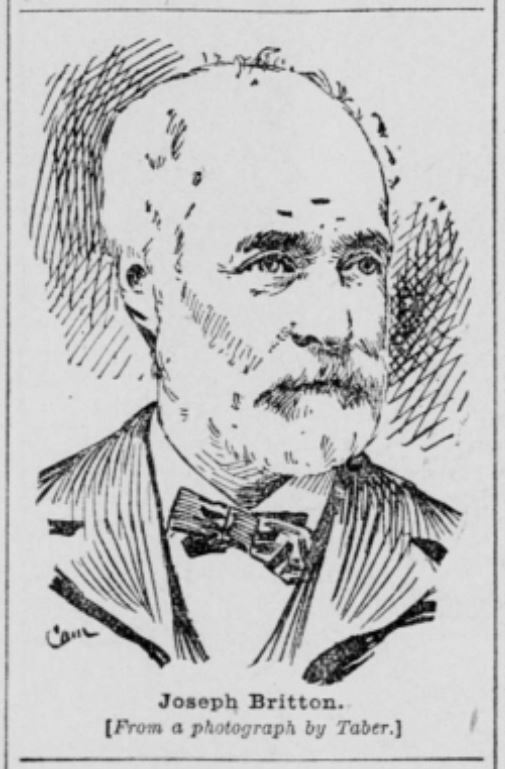 Joseph Britton was one of Andrew Smith Hallidie's partners in the Clay Street Hill Railroad. 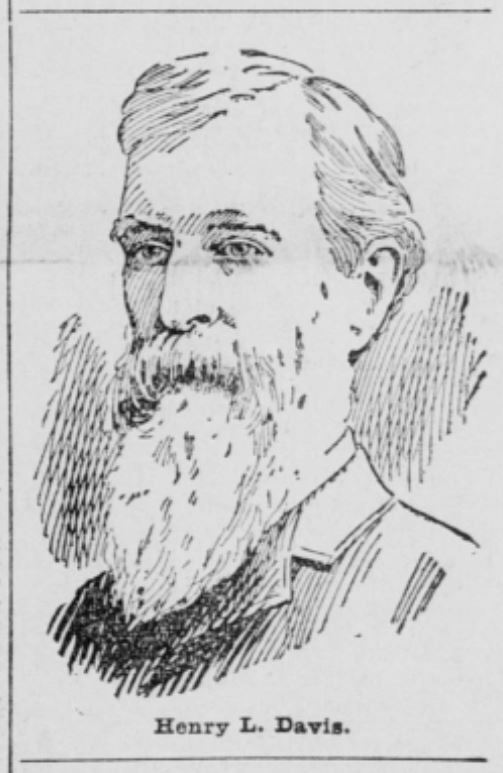 (Source: San Francisco Call, 26-April-1895). Back in 2009, San Francisco Sheriff Mike Hennessey contacted me. He was setting up a page on the Sheriff's Department website with an image of each sheriff who had served since the department was founded in 1850. One man he couldn't find was Henry L Davis, who served as sheriff from 1864-1867. I found not one but two woodcuts in digitized issues of the San Francisco Call. Henry L Davis was one of Andrew Smith Hallidie's partners in the Clay Street Hill Railroad. 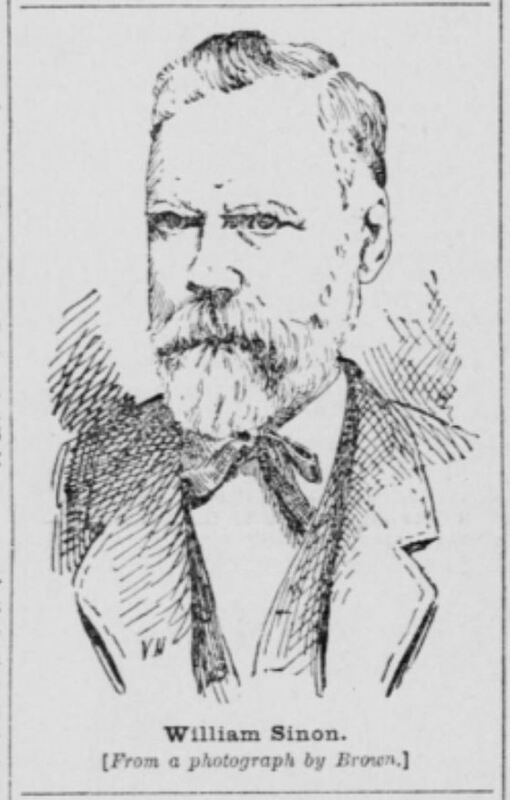 (Source: San Francisco Call, 26-April-1895). February, 2018 Picture of the Month. William Sinon was one of incorporators of Andrew Smith Hallidie's Clay Street Hill Railroad. He built the line's powerhouse. (Source: San Francisco Call, 26-April-1895). 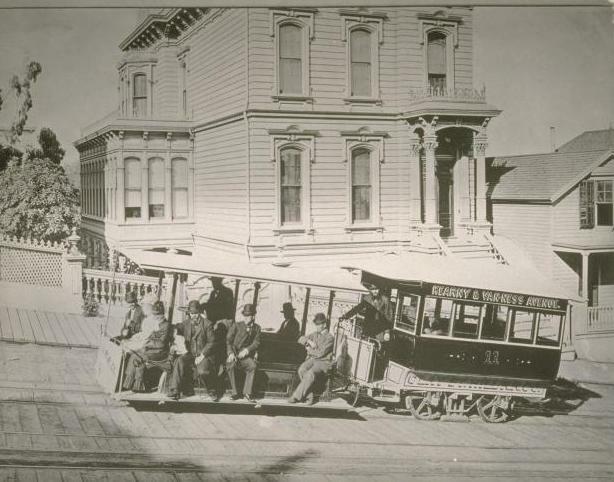 This line climbed Nob Hill and allowed the residential area of San Francisco to expand to the west. It connected the business area of Kearny Street with Nob Hill. The company was acquired by Ferries & Cliff House Railway on 08-Sep-1888. FCH discontinued the line on 09-Sep-1891 and replaced it with the Sacramento/Clay line. 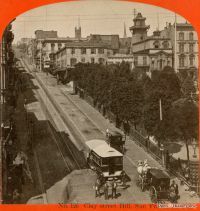 Read "The End of the Clay Street Hill Railroad", two 1892 magazine articles about the end of the original line, with an introduction by Walter Rice. 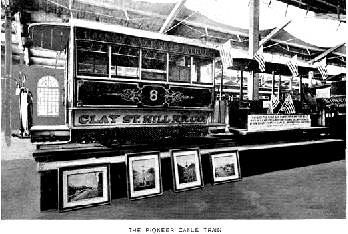 Clay Street Hill Railroad grip car 8 and trailer 1 (numbered 8 in this photo) on display at the 1893 World's Columbian Exposition in Chicago. Read more about it on the Chicago page. (Source: The Book of the Fair). Grip car 8 survived because the FCH sent it and CSH trailer 1 to Chicago for display at the 1893 Columbian Exposition. It also appeared at the 1904 Louisiana Purchase Exposition in Saint Louis. 8 wound up at the Baltimore and Ohio Railroad Museum in Baltimore. The Railway and Locomotive Historical Society found it and brought it to San Francisco in 1936. RLHS moved 8 to the Cable Car Museum in 1966. No one knows what happened to the trailer. Other CSH equipment burned at Washington and Mason in 1906. There is a plaque at the Clay and Kearny terminal of the line, which marks California State Historic Landmark 500. Clay Street Hill Railroad train, near Taylor (Source: [group 44:15350], Zelda Mackay Collection of Stereographic Views, BANC PIC 1905.14906-.16118 -- STER, The Bancroft Library, University of California, Berkeley.). Two Clay Street Hill Railroad trains, near Leavenworth (Source: [group 44:15349], Zelda Mackay Collection of Stereographic Views, BANC PIC 1905.14906-.16118 -- STER, The Bancroft Library, University of California, Berkeley.). Aug, 1998 (125th Anniversary) Picture of the Month. Clay Street terminal at Van Ness. Some people think the top-hatted man on the grip car looks like Andrew Hallidie. Photograph courtesy of the Museum of the City of San Francisco. "Clay Street Hill Rope Rail Road. Ascending an incline of one foot in six. -- The first cable road constructed." A Clay Street Hill Railroad train climbs the hill in this woodcut from "The Cable Railway Company's System of Traction Railways for Cities and Towns". September, 2008 Picture of the Month. 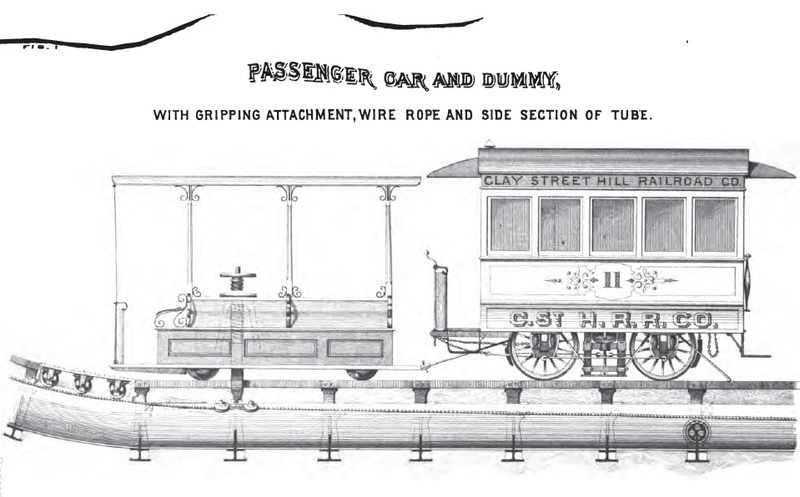 "Passenger car and dummy, with gripping attachment, wire rope and side section of tube." 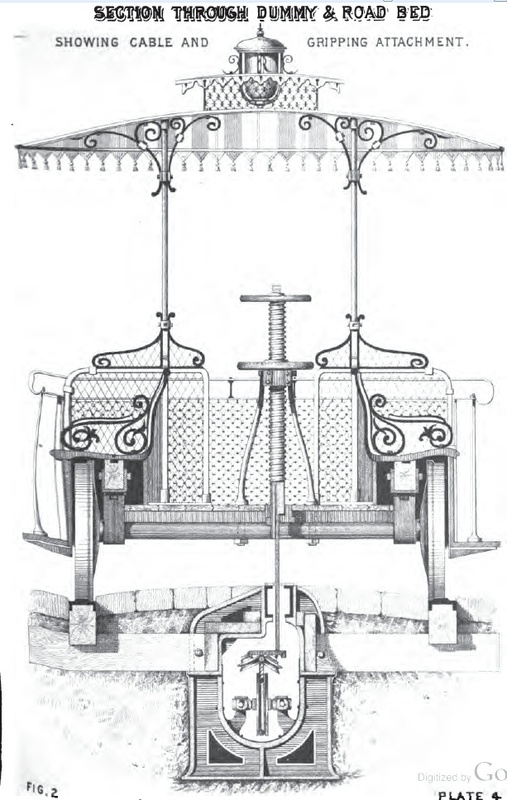 From "The Cable Railway Company's System of Traction Railways for Cities and Towns". Looking west on Clay Street at the terminal of the Clay Street Hill Railroad. One part of a stereoscope view. (Source: OpenSFHistory / wnp24.224a.jpg). 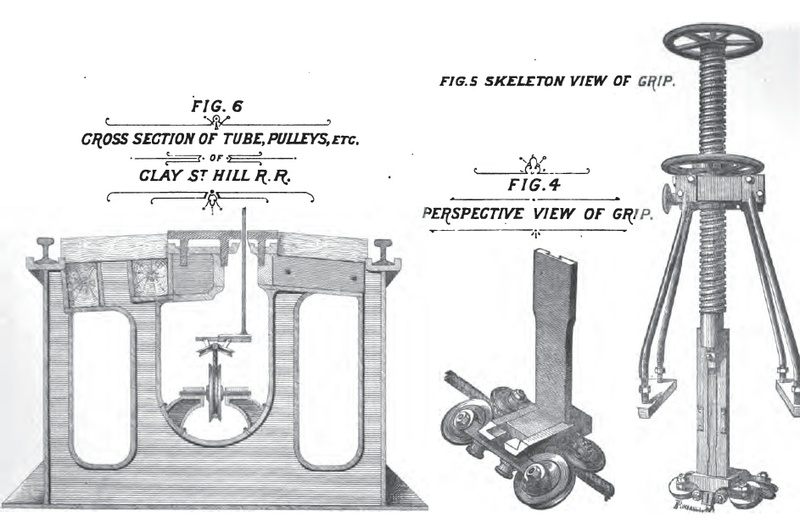 "Section through dummy & road bed showing cable and gripping attachment. Fig 2." From "The Cable Railway Company's System of Traction Railways for Cities and Towns". 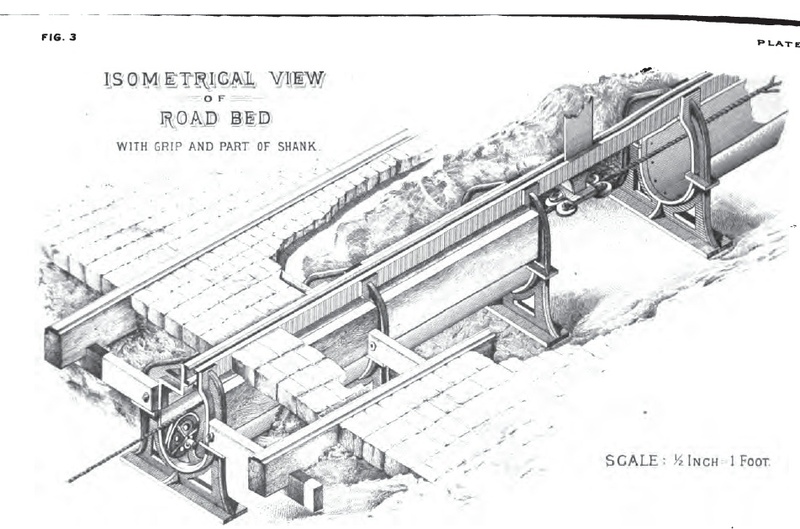 "Isometrical view of road bed with grip and part of shank. Fig 3." From "The Cable Railway Company's System of Traction Railways for Cities and Towns". "Fig. 4 -- Perspective view of grip. Fig. 5 -- Skeleton view of grip. Fig. 6 -- Cross section of tube, pulleys, etc. Clay St. Hill R. R." From "The Cable Railway Company's System of Traction Railways for Cities and Towns". 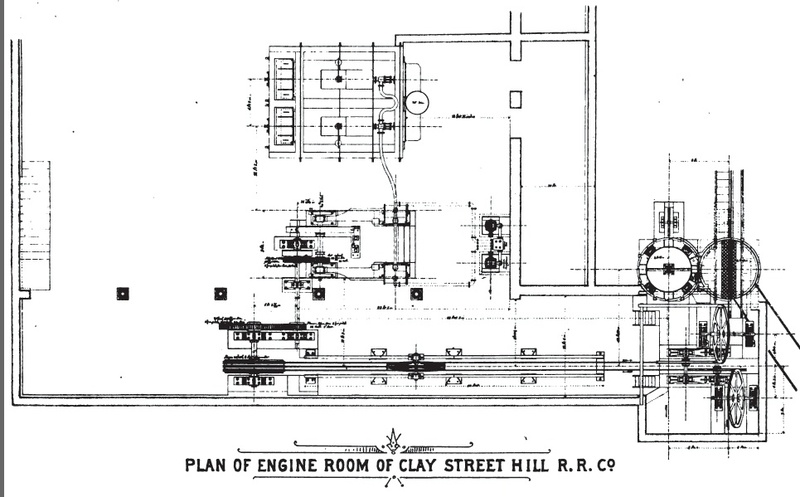 "Plan of engine room of Clay St. Hill R. R." From "The Cable Railway Company's System of Traction Railways for Cities and Towns". 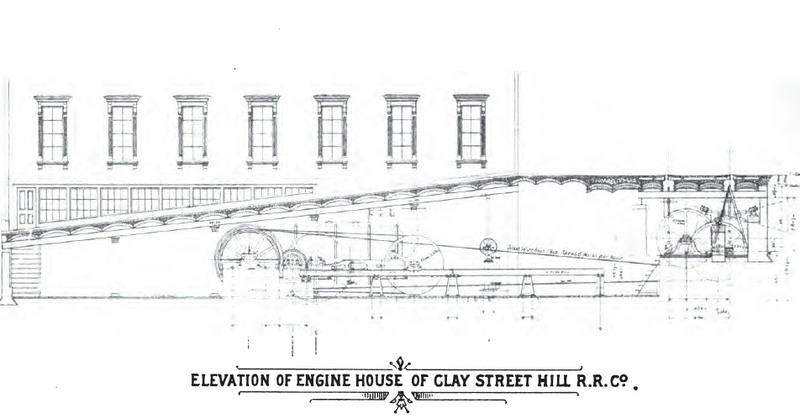 "Elevation of engine house of Clay St. Hill R. R." From "The Cable Railway Company's System of Traction Railways for Cities and Towns". Clay Street Hill Clay and Leavenworth powerhouse in 1899. Clay is at the right (Source: Sanborn Fire Insurance Maps, San Francisco, 1886, Vol 2, Sheet 46a). 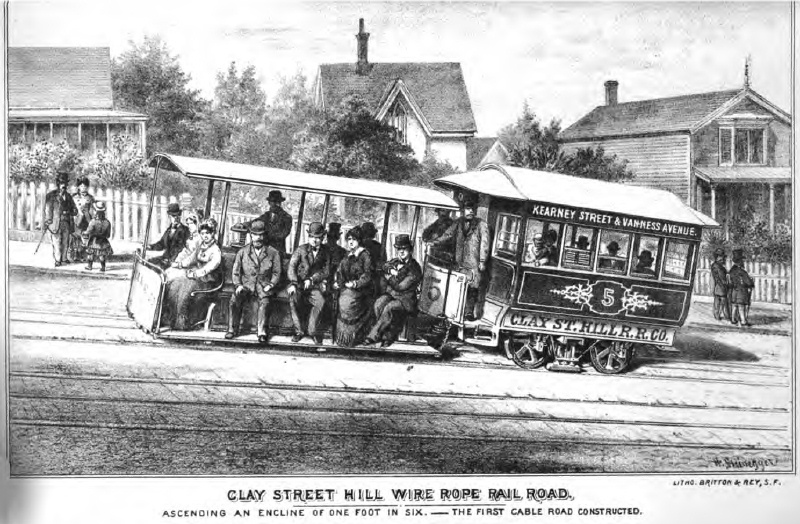 A model of a Clay Street Hill Railroad cable car. 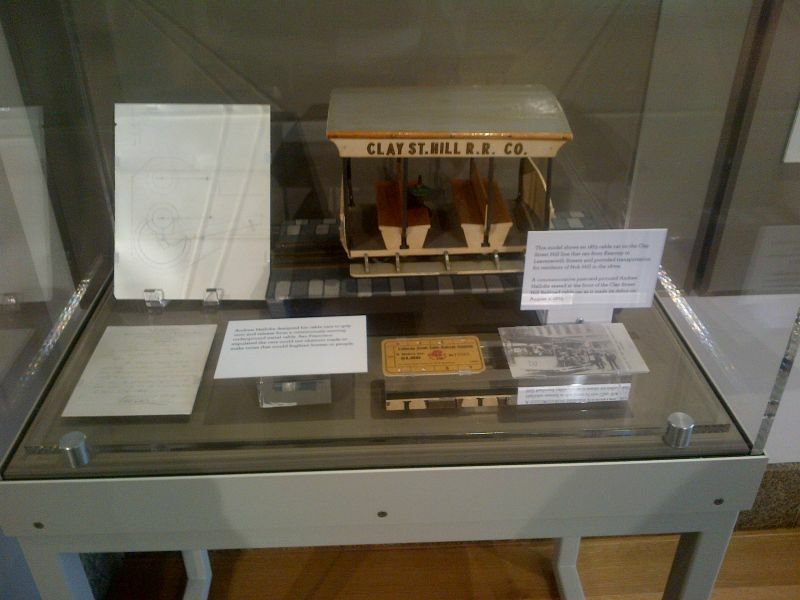 The Wells Fargo History Museum, renovated in 2013-2014, has a display case with a model of a Clay Street Hill Railroad cable car and mementos of Andrew S Hallidie. 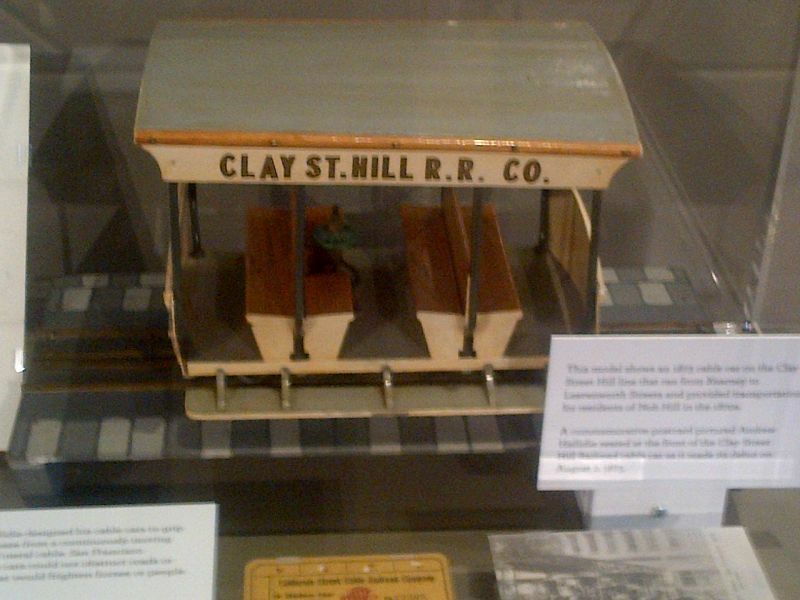 A model of a Clay Street Hill Railroad cable car and mementos of Andrew S Hallidie. Clay Street Hill (Cable) R.R. Co. operates 1 mile (double track) of road, and owns 11 cars. Directors, Joseph Britton, Henry L. Davis, James Moffit, Charles Mayne, Henry Steinneyger, J. J. Rey, C. P. Campbell, San Francisco, Cal -- Joseph Britton, Pres. & Supt., Charles Mayne, Vice-Pres., Chas. P. Campbell, Sec., Henry L. Davis, Treas., C. P. Campbell, Pur. Agt., -- GENERAL OFFICE, Clay & Leavenworth Sts., San Francisco, Cal. Copyright 1996-2018 by Joe Thompson. All rights reserved.